Centerpieces are the focal point of every table setting. Select a color and theme to match your graduation table's theme. 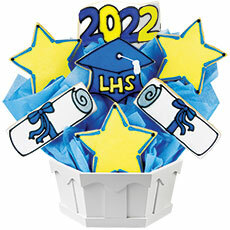 Our Congrats Grad cookie bouquet comes complete with cookies shaped as colorful stars, scrolls, a graduation cap, and 2013 banner. To personalize this gift with your school colors, please contact the delivering shop by phone. Note: Personalized colors will require additional lead time. Actual Container May Vary. This item is priced as a 7 cookie.